The pond lies between the canal towpath and the railway line ‘between the Nadee and the railway line crossing the canal. When the railway line was built in the 19th century, ballast was required for its construction and this was dug out of suitable sites beside the railway lines. Many of these holes filled up with water and developed into ponds, the largest of which in our area was opposite Findern School. When the power station was built in the 1950’s, the company required sites to deposit the ash from burnt coal. Landowners were paid to allow it to be deposited in these holes, so most of them disappeared, including this large one. It was a beautiful spot, a large pond surrounded by trees and wildflowers with an old railway carriage as a summer house. A small boat was kept there for fishing or drifting about in. Older villagers talk about the picnics and the Sunday School outings that were enjoyed beside the pond! All that remains of the beautiful area is a large grassy mound and some happy memories. The restoration of this Ballast Hole pond was made possible by British Waterways, who cleared all the undergrowth away and dredged the pond of decaying leaf matter. Several willow trees from around the pond were removed. The Group then undertook to replace the trees with wild fruiting trees such as crab apple, rowan, hazel and oak. The chippings from the felled trees were used to lay woodland paths. Large stones were installed as a feature and for the public to sit on. It is believed they were part of the old canal wall before they were replaced by modern shuttering. We have planted loosestrife, water avens, bistort, burr reed, water violets and dock in the pond. Funding from Biffaward has enabled us to add a pond dipping platform that the school, other youth organisations and the public can use. It has also enabled us to install more seating. 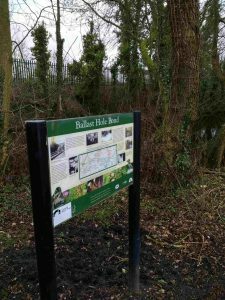 The project has been completed with the planting of wildflowers, ferns and heathers. We are very grateful to Biffaward for their support. Bat and bird boxes have been put in the trees. Please take time to visit and enjoy this beautiful area.